Shion 2.1.0b1 is now available. Regarding XMPP support: In this release, I am not limiting Shion to only talk to my own XMPP servers. If you want to run your own server, Shion can use that. That said, I reserve the right to remove/restrict this feature at any point in the future. If you wish to avoid problems with a future restriction, please send an e-mail requesting an XMPP account on an Audacious Software server. 1. 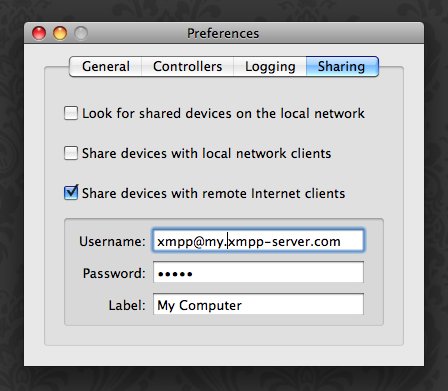 Shion needs its own XMPP account and the client needs an XMPP account. 2. Shion will not respond to commands from the client unless the client’s JID is in the Shion account’s roster. 3. Shion will transmit status updates via the user status field. These are the same messages conveyed using Growl. Please report any problems that you have or any additional commands that you would like to see. In terms of the Ad-Hoc commands, download Psi, log in, and right-click Shion in your buddy list to begin executing commands. Shion will only expose commands if it has devices that can respond to them.